Come and experience a fine example of green architecture right here on the farm with us. We’re busy expanding our accommodation as we receive more and more guests every year and don’t like turning them away. 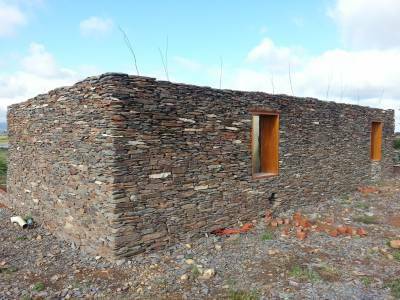 We’ve decided to build 6 eco-friendly stone cottages by using only natural building materials such as clay, reeds, wood and stones. Solar panels will be installed on the roofs as well as gas geysers. 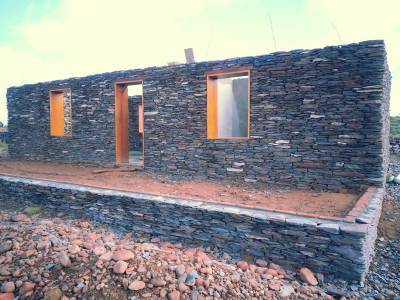 Each cottage will be fully equipped to accommodate 2 to 4 guests. The patio situated on the south end of the cottage, has a stunning view, overlooking one of our dams with an abundance of birdlife as well as the Outeniqua Mountains and red stoned hills in the south. We also offer a wide variety of activities, such as horse riding, meerkat tours, canoeing, various walking trails and swimming. Also come and end off the day with a delicious cocktail from our bar and enjoy it on the patio overlooking the Olifants river and surrounding mountains.